Working ways to Increase your blog traffic for more conversions and sales. Learn the top 7 ways to increase your blog traffic and earn more real money from your blog through online jobs at home. With growing internet users and usages, website/blog is becoming one of the best platforms to earn money. My ultimate aim of making a site on WordPress is getting good traffic to the blog, therefore, increased revenue for sharing knowledgeable articles and information’s on different niche. WordPress is better than other blogging software’s in customization, you can get maximum traffic on WordPress if you have quality articles updated on your blog regularly. It is very simple to do. 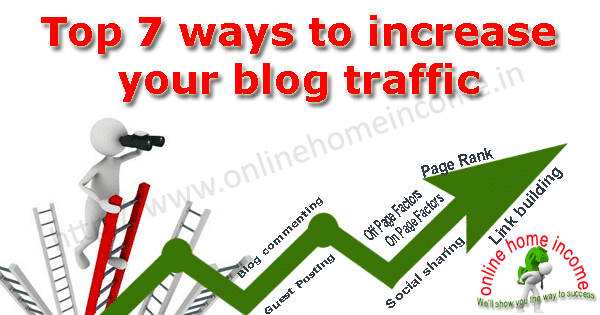 You can get maximum traffic to your blog by following some steps. There are many different to increase your blog traffic, but to make some quick money blogging, we need to drive traffic as soon as possible. This article was to those who wish to drive traffic from Social, Referral and direct sources because organic traffic requires more effort and work from your side. What do you learn now? These ways are not only used for search engine visibility. These ways will help you to increase your site ranking in all search engines. The dramatical increase in the use of Social networks among different people around the world has turned these networks into a huge business platform. Most blogger’s and Entrepreneur’s use these networks for their business to meet new clients, customer’s and for a new establishment. So, once you developed your blog, you should create one official fan-page on Facebook and create a group for your blog to get more traffic from Facebook. It’s pretty simple and you can easily create on the page with just few mouse clicks. Optimize the page looks and content so that people can easily understand what you offer? Majority of people using only Facebook for searching and finding new ideas. Search for Facebook groups which are related to your blog and join to groups which are having more than 10,000 members. Then post your site on to it. You can make it in few seconds. All people are expecting some advice’s and tips from experts, consultant’s, (or) with other’s who have knowledge. To those people, I admit joining in Forums (Group Discussion Blog) where people of similar mind unite together to discuss the certain topic. You will get a lots ideas for your next topic and also, you can get the new prospectus for your business. This is still working method to drive targeted traffic to your blog, this helps to make more sales. You can get a solution for your question, (or) provide answer’s for other’s question. Your active interaction helps to build a healthy community of people around your niche. I recommend joining Google Forums, Search Engine Land Forums, Yahoo Question and Answer’s, which are more useful to drive instant traffic to your blog. Register yourself and post your website links for your answers. It will help increase blog traffic as well as performance. I would like to mention some more forums that are digitalpoint.com, forums.seochat.com, forums.opensuse.org. To increase traffic to your blog, you need to update your blog with new quality and useful pieces of information. So, you need to write articles and publish on your blog. But, when you write articles and ask other blogger’s to publish on their blog is simply called as Guest Blogging. Try to post on popular sites which are related to your blog to get good traffic. Write good content with your blog link then request admin of that site to publish your article. Your post content should be unique and useful to the audience of the blog you are approaching. It gives good back-links to your site and instant traffic too. By advertising your site on Google ad words you will get targeted traffic to your blog. Google AdWords is a program, where advertisers will pay some fee to get traffic from the display advertisements. If your blog was related to selling any affiliate products, then this method will be more useful. Open Google AdWords and register your account using existing Gmail ID. After that, you need to give your related keywords and description to show your ad in places such as Search Results, Gmail Tabs etc. Google through their AdSense program, will help you reach more audiences from other blogs. It’s a pay per click program and you will receive Rs.2000 Worth free ad-credits when you first register your account with AdWords. Facebook is the most widely used social network in the world but it is not the only one. Use other social networking sites such as Twitter, Tumblr, Pinterest, Linkedin, Delicious, Reddit, Digg to share your blog posts to a lot of people. You may get low traffic from these kinds of social sites. But your site will reach a good position in the ranking. Your site may get a chance to show at the first page in Google search engine results. You will get quality visits. Submit your blog in free classified websites like craiglist.org. Classifieds sites are a category where you can list your offer’s and services for free. Many people who are using classifieds to get genuine online jobs (or) looking for the services they need. Sites I recommend are Olx, Click.in, Quikr, Locanto etc. allows users to register free accounts and post their ads in their categories. Blog commenting is the most efficient way to drive immediate traffic to your blog. Find blogs in your niche and write comments. Your comments should be constructive and helpful to the audiences of the blog where your comment will be published. Comment on blogs which are familiar to your blog with your blog link. It will help you to increase Google page rank and Alexa rank of your blog. Traffic is the main thing if you want to make money blogging. Without visitor’s (or) customer’s, you cannot make any sales (or) conversions, thus no income from your blog. There are four different sources to drive traffic, and those were: Direct, Organic, Social, and Referral. I will explain about these categories in the next article. I hope this article on Increase your Blog Traffic has given you some idea to drive instant traffic to your blog. If you know anything more please leave your comment below to share your thoughts with me.